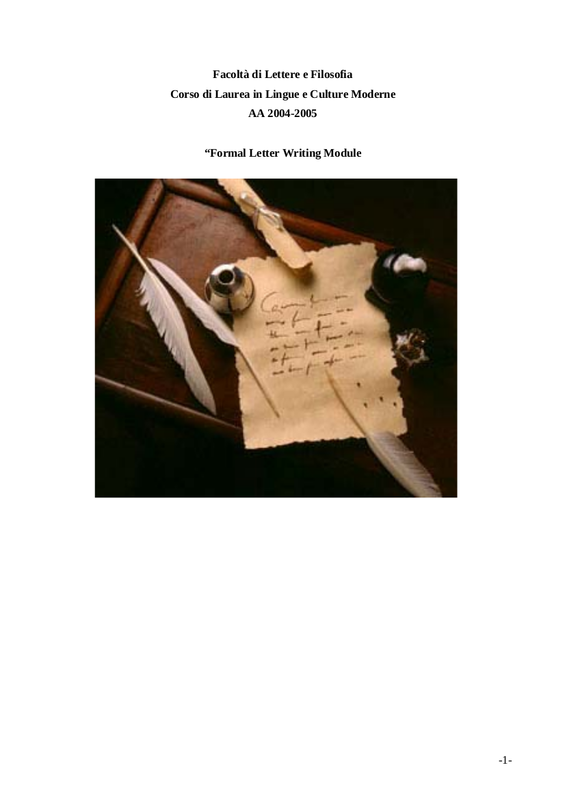 Not all of us had the privilege to be extensively taught how to write a business or a formal letter. Not all of us have also seen its importance since in this email-driven society, we already think that formal letters are now an extinct document that lost its purpose in the advent of the Internet. However, just when we thought, when applying for a job, there are still some businesses who required us to send a cover letter along with our resume; when we want to complain, we are to express it using a complaint letter, and; when we were asked to invite a prominent person, we should send a formal invitation letter as a show of respect. 1. Be concise and K.I.S.S. Always make sure you have stated the purpose of sending a formal letter in the first paragraph of the body of your letter. Never stray away from the subject for this will confuse the recipient. Even if you are sending a complaint letter, be polite and respectful. If you want your complaints to be attended to and be regarded with respect, treat the receivers of your complaint letter as well. If they have disrespected you in the first place and is the reason why you are giving them a complaint letter, this does not mean that you have to be disrespectful in return. You may also see examples of writing a DBQ essay. After proofreading your letter, you may want to have someone else to proofread your formal letter. There can be instances wherein you have may still have overlooked errors in your letter. This is because you have read it for so many times you think you have already got everything right. 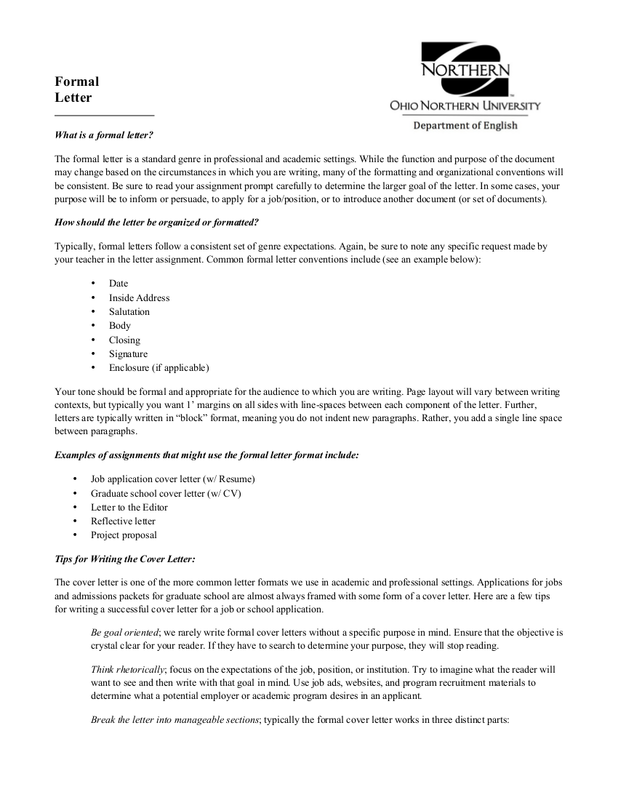 Unless there is a deadline for submission, just take your time in writing a formal letter. Rushing will only lead you to make a lot of mistakes and this will give a bad impression of you in the eyes of the receivers of your formal letter. You may also see examples on writing a family history report. Even in the modern times, the first impression really lasts, that is why you should also not take the presentation of your formal letter for granted. You may also see tips in writing a reflective statement (PDF). Aside from making sure that the content is near-flawless, you also have to make sure that you have used a good quality paper and a matching envelope, or at least clean, for your formal letter. Also, make sure that you know how to label the envelope properly. Even those are just the physical aspects, it would still matter because it is where you will place the content of your letter. You may also see writing a heartfelt resignation letters. Despite the first tip, do not take conciseness too far to the point that its read like a telegram. You should not write what should be said but you should also mention the important words that can help you achieve your goal. Some people would say that is wrong to include basic facts about you when in fact you really should make sure you include enough background for your reader to at least know who you are especially if you are both strangers to each other and that they would also get what you mean. 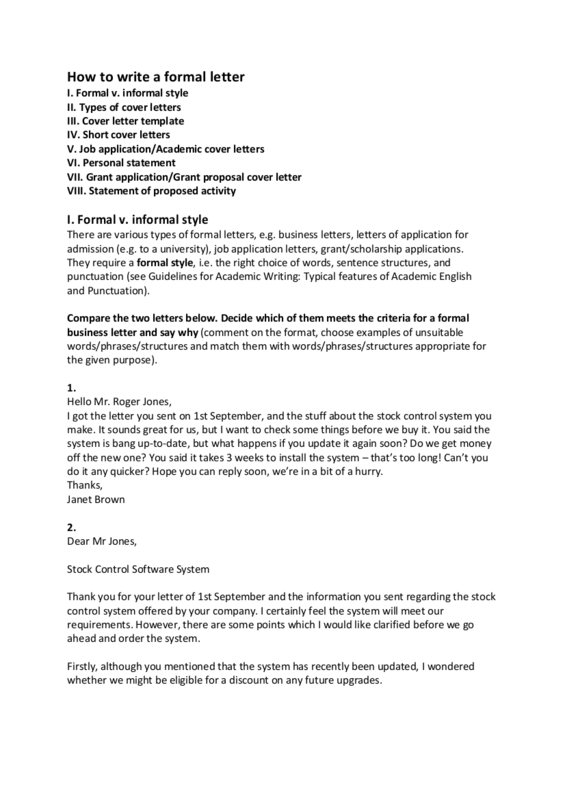 You may also see business proposal letters. When being specific in your letter, it means that you do not express an abstract idea to the recipient of the letter and leave it to him or her your purpose of sending a formal letter. If you are to discuss and propose ideas, do so with concrete examples. If you need numbers, include them in your letter. However, do not go too far in creating a complete and specific mental picture for the receiver of your formal letter. You would already know you’re going too far if you yourself will feel overwhelmed reading the formal letter you just wrote. You may also see formal writings. 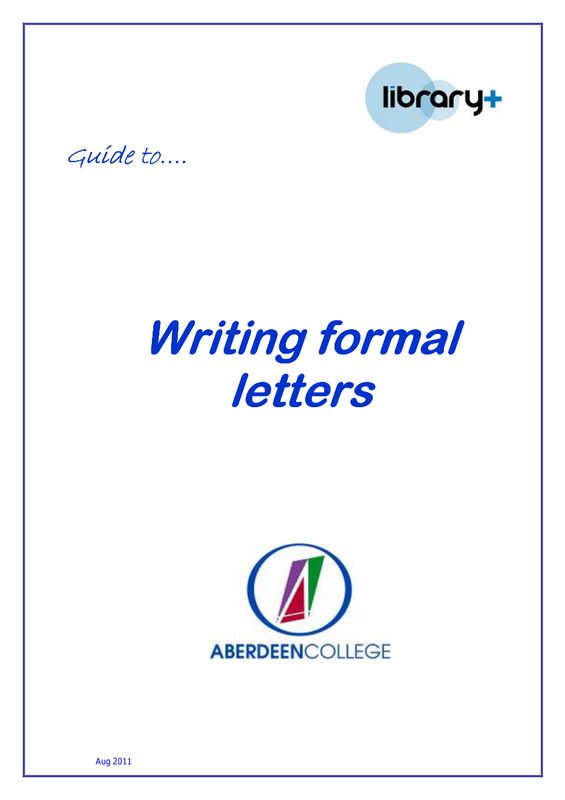 There is a standard format to follow when writing a formal letter. This standard format can actually help to present your letter in an attractive and impressive manner and will ensure that your thoughts are well-arranged and will be taken seriously by the recipient of your formal letter. You may also see formal notices. The heading consists of your address and the date. Keep in mind that your name is excluded in this part. You may or may not include your contact number or your email address in this part. When Using block format, the heading goes in the top left-hand corner of the page. 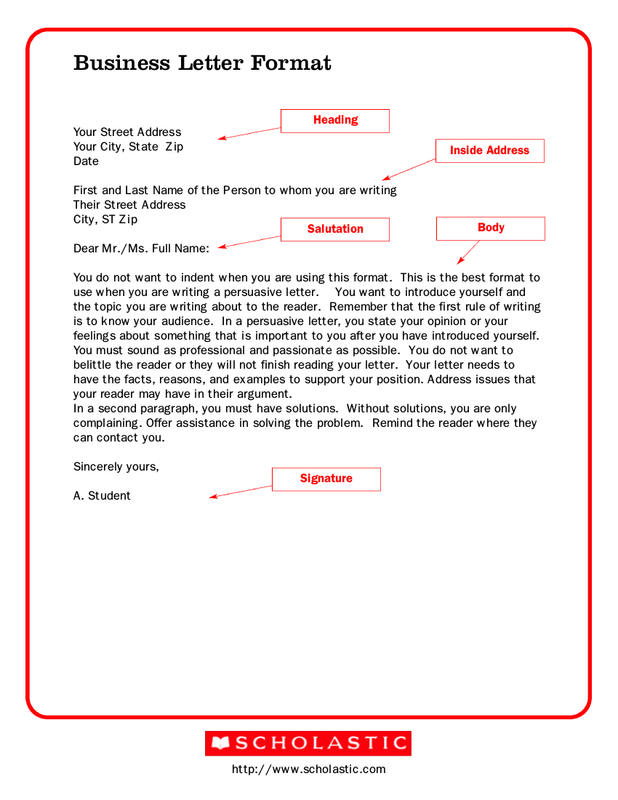 The inside address consists of the name and address of the person to whom you are sending the letter. As much as possible, address the formal letter to a specific person because it would sound disrespectful if you would only put “to whom it may concern”. If you really do not know his or her full name, you can just at least try to include his or her title. You may also see formal emails. This part is where you will greet and the most usual greeting is Dear. After your choice of greeting, you will then add the person’s name and punctuated with a colon. There are some cases wherein you do not know whether the person you are addressing is a man or a woman, you may this: Dear Sir or Madam. Also, take note of the civil status of the person you are sending the letter to. It’s easier for the men because you can just use Mr., but as for the women, there are various choices like Miss, Ms., and Mrs. If the person has a specific title such as Dr., Hon., and Engr., make sure that you use it. After the salutation is the Body of the letter – the main part of the letter. The way you indent each paragraph depends on the letter format you are using. It is adviced that you follow the tips above when writing this part. This is the end part of the letter. Even if the closing usually consists of two words, the only word with the first letter capitalized is the first word. Before the signature, you must first punctuate the closing with a comma. 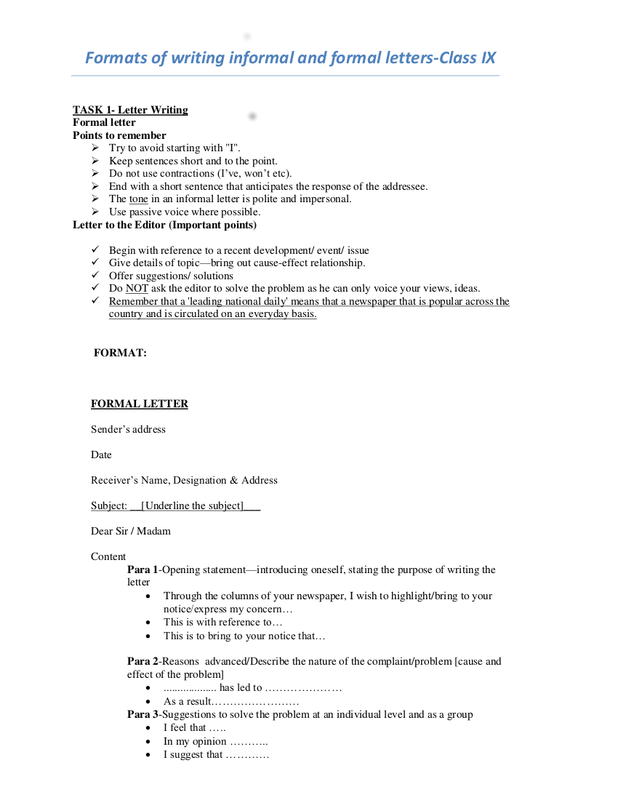 Leave at least two spaces between the closing and the signature so you will have an ample space for your signature.We hope you have gained insights about formal letter writing with the help of this article. You may also see offer letters.